A new version of the Visual Jobs Scheduler, our Microsoft Dynamics NAV project planning add-in, has been released. The interactive planning board for visualizing jobs, job planning lines, job tasks, resources and resource allocations offers two major new features that are introduced in this blog post. Read below what we've come up with. 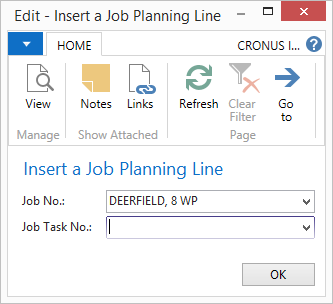 Up to now, job planning lines for an existing job task of the type posting could only be created in the Jobs View. From now on, users of our visual project planning add-in have the same capability with the Resource View via the context menu item "Create Job Planning Line". Selecting the according item from the context menu calls a dialog for entering the missing job and job task information. Clicking on the drop down symbol next to Job Task No will call a dialog to select from available Job Task numbers. This way, the user can display even more individually relevant information in the planning board. Check out the features released with version 1.3 end of 2015. Want to see the new functions in action? Schedule a demo via the below button. Alternatively, attend the online-webinar in which we presented all new features of all our visual scheduling add-ins for Dynamics NAV.